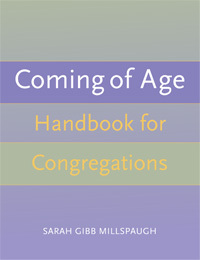 Comprehensive and practical, Coming of Age Handbook for Congregations is a treasury of tools for the religious educator of adolescents. As youth prepare to leave childhood, congregations seeking to honor this transition will benefit from the wealth of ideas in this guide. Coming of Age Handbook for Congregations is filled with workshops for youth, small group ministry sessions for parents, social action projects and rites of passage. Participants will explore theology, spirituality and history through discussion, drama, music, writing and art. Field tested by congregations with groups ranging from four to twenty-three participants, this guide will help both congregations and youth to define their beliefs and put their faith into action. "As a parish minister who has been supportive of and involved in various Coming of Age programs for some forty years, I roundly welcome this trenchant compendium of resources! The material is thoughtful and comprehensive for all the participants in Coming of Age endeavors, but it also contains pearls of wisdom useful for Unitarian Universalist congregational life at large. What a treasure trove!" Rev. Tom Owen-Towle, author of Growing a Beloved Community. To see "Workshop 12: Learning to Lead Worship", click here. Session 1 Parenting: How is it going? Workshop 2 The community building continues!